Place and Location are two of the five themes of geography and a natural starting point for a study of the Arctic and Antarctica. Location answers the question, "Where am I?" while the study of place asks, "What kind of a place is it?" and, "How does this place connect to my hometown?" 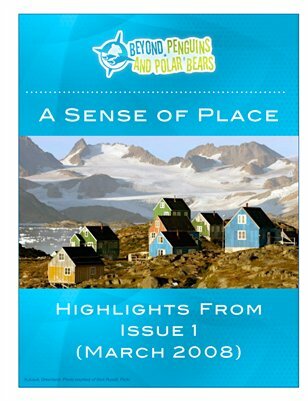 This issue of Beyond Penguins and Polar Bears examines how you can introduce the Arctic and Antarctica and use science, geography, literacy, and technology to help your students compare and contrast these two dramatically different areas as well as their own home. Get ready for an adventure as you and your students develop your polar sense of place!